Israeli Prime Minister spoke during Knesset session marking the anniversary of Prime Minister Yitzchak Rabin's assassination. Prime Minister Binyamin Netanyahu described the assassination of former Israeli Prime Minister Yitzchak Rabin as one of Israel's "darkest moments", during a Knesset memorial event this afternoon. "In 66 years of our independence we have experienced happy times and difficult ones; times of great elation and in contrast times of anxiety, pain and grief," he began. "But one dark moment will remain forever in infamy in the history of the State of Israel - the night that Yitzchak Rabin was murdered in the heart of Tel Aviv." What made the assassination all the more tragic, he said, was "the fact that the Prime Minister was killed at the hands of a Jew," adding that "there can be no forgiveness for the murderer. It is forbidden to pardon him." 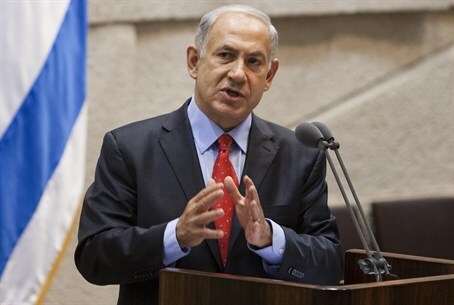 Netanyahu continued by underlining the human aspect of the murder of Israel's two-time Prime Minister. "The murder of Yitzchak Rabin was not just an assault on Israeli democracy and a blow to the heart of the nation, it was also an enormous human tragedy," he said. "Rabin was a special man rooted in values, shy and opinionated at the same time. Completely open to the changing world around us," but above all else a man who cared deeply about the future of the State of Israel and its security, he said. Yitzchak Rabin was murdered by a Jewish gunman on 4th November 1995, as he attended a left-wing rally in support of the Oslo Accords, which granted control over parts of Judea and Samaria to the Palestinian Authority, as well as weapons for its security forces, as part of a much-vaunted attempt to end the Arab-Israeli conflict. That attempt ultimately failed, with the Accords widely seen as responsible for increased attacks against Israel by terrorist groups, culminating in the bloody "Second Intifada" which killed more than one thousand Israelis, mostly civilians.